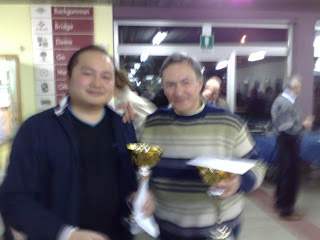 hairulovchessmaniac: Richard Kimbin runner-up in 29th Trofeo Edoardo Crespi Open A 2008 ! Richard Kimbin runner-up in 29th Trofeo Edoardo Crespi Open A 2008 ! My "Italian" friend - Richard Kimbin finished in 2nd place in the 29th Trofeo Edoardo Crespi Open A held in 4-8 December 2008 in Italy. The tournament was won by CM Giuseppe Bisignano. The most interesting fact about Richard's victory is he is in fact the last seeded ( 48th seed) with FIDE 1697 rating but he overshadow almost all of them. In my opinion, Richard current rating didn't show his"accurate"strength. He is easily a FIDE 2000+ player . Both players end with 5.5 points from 7th round but Bisignano has a better tie-break to clinch the title.